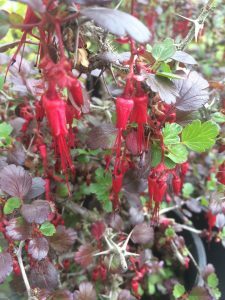 Fuchsia flowering gooseberry is a fantastic shrub for dry shade. Heavily armed arching stems produce rows of pendant blood red flowers beginning in December and continuing to early spring. Retains leaves in winter – loses them in heat and drought. Little to no water once established. Best in part shade with good drainage. The millions of little red flowers are irresistible to over wintering Anna’s hummingbirds. Locate away from paths…the thorns on this California native shrub have a bite.